I don't know what has been going on with the weather recently, but I like it. I'm pretty glad the sun has finally decided to make an appearance, although I wasn't so much enjoying trudging about in Dr Martens, so I was delighted to be asked to review a pair of summer sandals. I went straight after college to see the choice on offer for my vicious scrutiny. Honestly, I've never had such an easy shoe buying experience (thanks to the nice people in Clarks). When I was younger I drove my mum to distraction because I was so fussy. I was in and out within 10 minutes! The shoes I decided on were £45, and are made from leather. They also have the comfiest cushioned sole. See them in the pics of me being extremely comfy or on the site for yourself here. 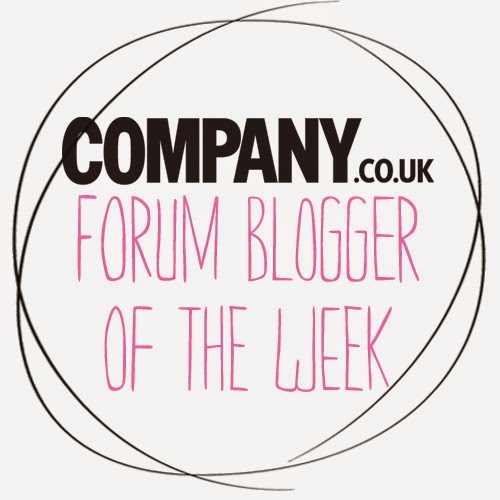 If you have a spare 3 mins, it would make my day if you could vote for fashionrhapsody.com in the company style blogger awards. I'm in the 'best teen style blogger' catagory. The voting ends on Friday, there are some more details about how to vote in the post below. Also, thank you to anyone who has voted already - you da best! 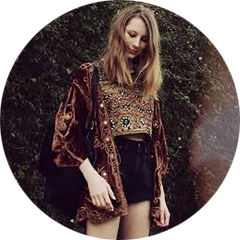 I've been short listed for best teen style blogger! So, last night I went to check the company website to see the short list for the style blogger awards. I honestly didn't expect that I would have made it, there are so many great teen bloggers about. When I found out I had made the top ten I was pretty shocked! I'm so thankful to everyone who nominated me, it's such a cool thing to have achieved. It would be amazing if you could vote for me under 'best teen style blogger', I'm in the 8th category on the Company page and all you have to do is select 'Fashion Rhapsody' - if you want to that is! The submit button is at the end of all the categories. click here to go the nomination page! Flares: Gap via charity shop, top: charity shop, jacket: charity shop, shoes: topshop, hat: topshop, belt: DIY from a Moschino bag (post coming soon). When I came across these flares from gap, I was initially dubious about spending a whole three quid on them, but I tried them on, and I really liked the way that they looked. I do wish that they were a bit tighter at the top though and more flarey, but I can't really complain for £3. But yes, flares are back now - I hope. I've been seeing them crop up all over the place in the blogosphere, looking especially groovy with platforms. Yes, I really did just say groovy, get over it. 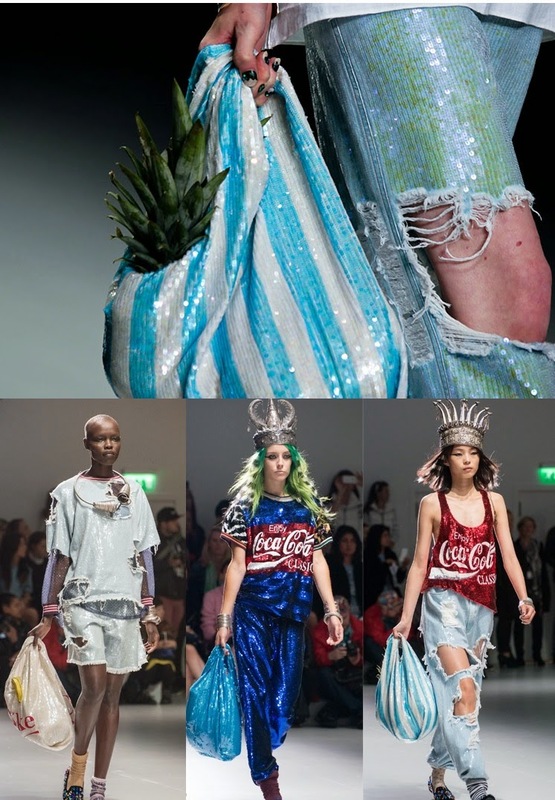 I loved the Ashish SS14 collection, boho got attacked with sequins and the result was fabulous. The supermarket bags seemed to catch everyone's eyes. The only thing that was holding me back from owning one, was the price. £270 to be specific, and for something I believed I could make in under five minutes and for less than 3% of the price, there really wasn't much point in forking out. All you need is a sequinned dress that has 4 thick straps, thanks to the 90's ebay is loaded with them and they're all pretty cheap. I found mine in a charity shop for £7, which was a bit steep I suppose but the colour of the sequins was too amazing to pass up. You don't need to dismantle the dress, all you need to do is turn the dress inside out, cut a straight line about 35 cms down from the bottom of the straps, then pin the bottom together and sew along that line. Make sure you reverse the stitch at the edges to make sure that it is strong enough. Now turn it inside out, you now should have a bag! Hi, I'm Rose. I'm 17, and I study fashion at college. I'm happiest when I'm blogging, sifting through stuff at a carboot, or eating spaghetti. I dont mind if you use my images but it would be nice if you linked back to the mothership.... Powered by Blogger.